The Zionist Organization of America’s ongoing efforts to ax McMaster as National Security Adviser gained considerable momentum after securing the support of Zionist billionaire donor Sheldon Adelson. WASHINGTON – Since replacing embattled former National Security Adviser Michael Flynn, Gen. H.R. McMaster has been a key fixture of the Trump White House, helping to guide the president’s neoconservative foreign policy – particularly in Afghanistan and Syria. Yet recent reports have suggested that McMaster’s days may be numbered, owing to differences of “personality” and “style” with the president and months of tensions said to have resulted from McMaster’s private criticisms of the president’s intelligence. While mainstream reports have painted McMaster’s likely departure as resulting from clashes with the president himself, the more likely reason for his exit is an effort by the pro-Israel lobby, namely the Zionist Organization of America (ZOA) — the oldest Zionist organization in the United States. Though it was once considered the most influential Zionist organization in the U.S., ZOA lost prestige after Israel’s founding, only to regain influence in recent decades by appealing to hard-line, conservative American Jews and Christian Zionists. Beginning in August of last year, ZOA has lobbied to have McMaster replaced as the head of the National Security Council owing to what ZOA asserts is an “anti-Israel” bias. ZOA President Morton Klein, a long-time admirer of former Trump advisor and Christian Zionist Steve Bannon, expressed major concerns over McMaster’s stance on issues involving Israel and its arch-rival Iran. The basis for this claim relates to McMaster’s having fired individuals who opposed the Joint Comprehensive Plan of Action (JCPOA), popularly known as the Iran nuclear deal, and hired individuals supportive of the framework aimed at limiting Iran’s nuclear power program. However, reports that he referred to Israel as an “occupying power” and acknowledged the existence of Palestine have also earned him the ire of American Zionists, who support a revisionist history of the creation of the Israeli state. ZOA’s efforts to ax McMaster gained considerable momentum after securing the support of Zionist billionaire donor Sheldon Adelson. Adelson has long been an ally of Trump — donating tens of millions of dollars to his campaign, serving on his inauguration team, and regularly having private meetings with the President. Adelson has also guided Trump’s foreign policy as it relates to Israel, as he was a key player in the President’s decision to recognize Jerusalem as the capital of Israel and has offered to pay a significant portion of the cost to relocate the U.S. embassy to Jerusalem from Tel Aviv. Unfortunately for McMaster, Adelson has offered to support the ZOA, though he stopped short of directly funding such efforts or publicly voicing support for them, according to some reports. However, ZOA still receives a significant portion of its funding from Adelson. In addition, it seems ZOA’s efforts have influenced the other top generals in the Trump administration, as NBC reported that McMaster’s likely ouster was now being orchestrated by Chief of Staff John Kelly and Secretary of Defense James Mattis. 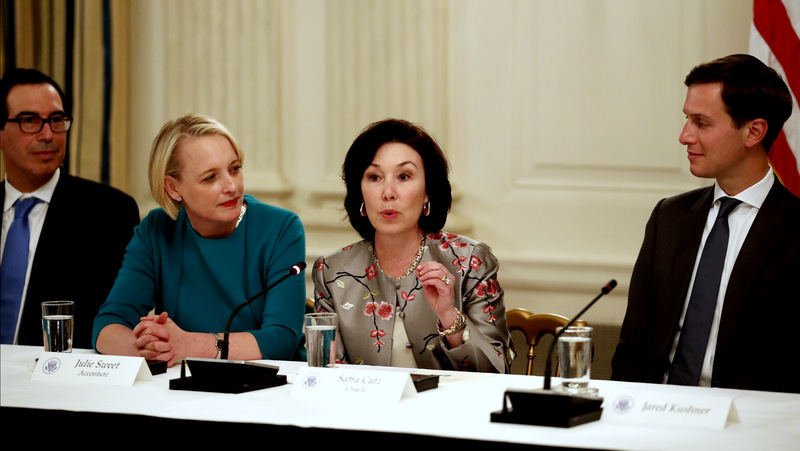 Adelson’s support for ZOA’s campaign occurred as a result of a meeting between him and Oracle CEO Safra Catz, now considered a top contender to replace McMaster. According to Forward, Adelson – despite having previously distanced himself from ZOA’s push to challenge McMaster – changed his mind after Catz recounted “a dinner she had with [McMaster] recently.” A recent report from Buzzfeed suggested that, during that dinner, McMaster had called Trump a “dope” and an “idiot,” though these claims were disputed at the time. Born in Israel and raised in the United States, Catz was once a favorite for a position in the Trump administration. Following Trump’s election, Catz joined his transition team and was considered as a candidate for the position of U.S. trade representative or director of national intelligence. She is an ardent Zionist — a view in part shaped by her mother, who was a Holocaust survivor — has a close relationship to Adelson, and donates to pro-Israel Republican politicians such as Senator Lindsey Graham. In the corporate world, she is known for her aggressive negotiating style. Another indication that McMaster’s imminent ouster is related to his stance on Iran and Israel’s regional goals is the fact that, aside from Catz, John Bolton is another top contender for head of the National Security Council. Bolton, a well-known neoconservative who served as ambassador to the UN under George W. Bush, is a staunch supporter of Israel and a vocal proponent of an aggressive policy towards Iran. He has recently been in the news for his support of arming protesters in Iran, an Israeli “first strike” against Iran, and the U.S. pursuing regime change against Iran. He has also been vocal in his contempt for JCPOA since it was first proposed. Yet another candidate for McMaster’s position is Stephen Biegun, an executive at Ford who has worked under hawkish government officials such as former Secretary of State Condoleeza Rice and Tennessee Senator Bill Frist. He has served on the Council of Foreign Relations and is also an adviser to the hawkish D.C. think-tank, the Center for a New American Security, whose CEO Victoria Nuland was a key player in the U.S.-backed regime-change operation in Ukraine. Beigun, like the other top contenders for McMaster’s position, is also a staunch supporter of Israel and an opponent of the Iran deal. Not surprisingly, the corporate media have painted the possibility of McMaster’s removal as yet another casualty of the tumultuous environment of the Trump administration, a narrative that characterizes major upheavals in the White House as born out of the whims of a petulant and vindictive President. Though Trump’s temperament may certainly be a factor, in McMaster’s case the evidence instead seems to suggest that it is the Israel lobby and its billionaire donors that are pulling the strings.